In the 55th issue of the Bed and Breakfast E-Traveller, we invite you to visit Edmonton, Alberta’s capital and a city that offers visitors abundant opportunity to experience exciting activities and entertainment in all seasons. Within the Festival City, Edmonton enjoys a full roster of cultural, sporting, and fun filled festivals. With a festival every month of the year, from ice carving in February to the Fringe Theatre event in August, Edmonton boasts one of the richest and most dynamic arts communities of any city in the country. All performed in magnificent facilities such as the Winspear Centre, the newly renovated Jubilee Auditorium, and the Citadel Theatre, among others. Great shopping abounds with the world famous West Edmonton Mall, as well as unique local stores, gallery areas, and shopping areas such as the Old Strathcona District on Whyte Avenue. Prices are competitive and Alberta has no sales tax. Sports fans know Edmonton teams are always competitive and entertaining to watch. Rexall Place, home to the NHL Edmonton Oilers, and Commonwealth Stadium, home turf of the Edmonton Eskimos, are both easily accessible by public transit. Both facilities host numerous sporting and cultural events year-round. The Provincial Museum of Alberta is one of Canada’s most popular museums. Seasonal exhibits combine with permanent attractions. The most recent being Wild Alberta and the acclaimed Syncrude Gallery of Aboriginal Culture, which brings 11,000 years of native history to life. Fort Edmonton Park offers a glimpse of early life in the fur trading era, frontier life in 1885, and a peek into the brand new city of 1905 and its progress into the 20th century. Other attractions include the Odyssium, Valley Zoo, and Muttart Conservatory. For more information on these and other attractions, please see www.edmonton.com, or call 1-800-463-4667. 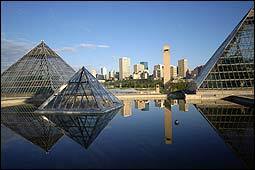 The Greater Edmonton Region is full of exciting and informative attractions just beyond the city limits. To the east, Elk Island Park, Canada’s first wildlife sanctuary, offers canoeing, hiking, and cross country skiing as well as the opportunity to view wildlife including bison, moose, elk, and many species of birds. In the same area, the Ukrainian Cultural Heritage Village showcases Ukrainian settlement in Alberta circa 1892-1930. Visitors can be time travelers and interact with period players portraying the pioneers. There are over 30 buildings to explore, traditional foods, and a gift shop. 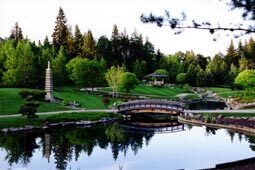 For information on the Village’s special events, check the website at www.cd.gov.ab.ca/uchv. Just west of Edmonton, picturesque Parkland County is home to beautiful golf courses and outdoor attractions that highlight the area’s natural splendor. See more information at www.infoedmonton.com or call 1-800-463-4667. EDMONTON'S BEST IN BED & BREAKFAST offers friendly hospitality, great food, comfortable beds, relaxation and security. With 38 B&B homes in the region, we can offer travellers the experience they desire. Country charm, ultra-modern contemporary, or character-filled historical homes -- we have lots of variety at prices that make wonderful sense. CLICK US at www.bbcanada.com/associations/bbage/ or CALL US at 1-866 432 7116. We look forward to hosting you during your visit to Edmonton. You will enjoy the warm and friendly hospitality of Edmontonians as well as the cityscape and the beautiful natural areas of the river valley and areas beyond. Edmonton’s charm lies in its balance of sophisticated and exciting events, engaging attractions, and friendly ease. Enjoy.